He was looking forward to going to Grade 0, having fun in the playground and making lots of new friends. But it wasn’t long before Lelo Mofokeng’s excitement turned to misery thanks to a bully who honed in on him on the jungle gym, regularly shoving him and punching him in the stomach. He hated going to school. And then his mom stepped in. 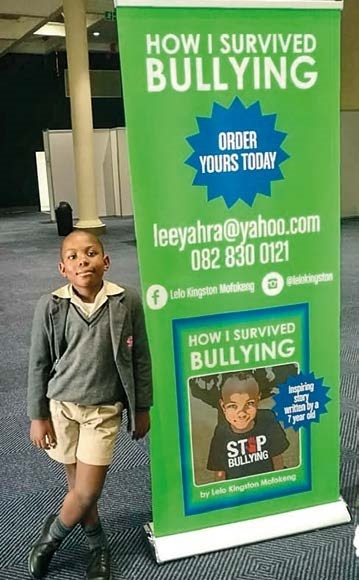 Lerato Rakgaba confronted the bully and put a stop to her son’s torture – and started a process that young Lelo hopes will help kids everywhere who are being bullied. 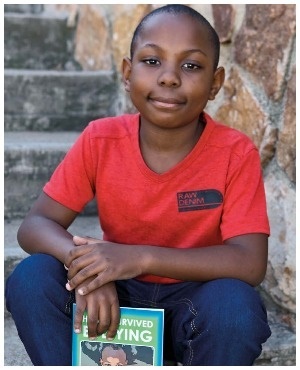 Now nine years old, Lelo has written a book, How I Survived Bullying, about his experience to honour his “superhero” – his mom – and hopefully change lives. Lelo is now confident and outspoken and a far cry from the timid, fearful little boy he used to be a few years ago. “Being bullied was painful,” he recalls. He would cry a lot but didn’t want to speak out about what was going on. “I wanted to keep it to myself so that I didn’t worry other people – I was worried about my parents’ feelings,” the young author tells us at his primary school, The Ridge School in Westcliff, Johannesburg. But when life became unbearable he knew he’d have to tell his mom – and she stepped in like a tiger protecting her cub. “I never stood up to the bully, my mom did – I didn’t do anything!” he says. His mom talked to the bully at a classmate’s birthday party she had dragged her son to and warned him to stop picking on her son. What Lelo did right was telling an adult and that’s the message he wants to get across. Suffering in silence is not the way to go and he wants other kids to know there’s always help available if you reach out for it. Lerato (34), Lelo says, is his “momager”, – his mom and his manager – and his face lights up as he tells us how she helped him be happy again by putting a stop to the bullying. Writing has been a part of their lives since her son was able to read and put pen to paper, Lerato says. She raised her boy to always look for the positive in situations and be thankful for every day. Lelo could read by the time he was four and started writing in the journal soon afterwards,” she says. Lelo says he has no hard feelings towards his bully. He understands he had a “sad heart”, as he puts it, and it made him feel better if he picked on other kids. He calls his bully Ken in his book. “Ken had a mean face and every time I saw him, my heart would hurt and my tummy would run. I hated school. I hated being at school. I hated being sad all the time,” he wrote. Lelo, an only child, comes from a creative family. His mom is a cake design artist and a skilled events coordinator and has now added being a “momager” and book distributer to her list of talents. Lelo’s dad is musician Sello Mofokeng, better known as Nemza, a former member of award-winning hip-hop crew Skwatta Kamp. The parents believe in nurturing their son’s talents and creativity and Sello (37) has been promoting the book on his Twitter account to his thousands of followers. “At the age of 6 he was bullied at school and at the age of 7 my son @lelokingston decided to write a book about his experience,” he tweeted. Lelo has been writing children’s books since he was in Grade 1, mostly centred on his favourite superheroes. But How I Survived Bullying, which he started writing by hand in 2016, is his first book to be published. He finished it in a year while in Grade 1 and his mom then typed it up. “When I finished writing the book I didn’t really care about, like, publishing or anything,” Lelo says. “I thought I’d just write my feelings down, you know?” But his mom realised it could help other children and they self-published the book. It has now become a part of children’s book clubs around the country, where kids come together for a reading play date either at home or in a library and read books by young authors. Lelo and his mom have also become anti-bullying campaigners. So far 1000 books have been printed since May and over 600 have been sold. The book, which costs R150, can be ordered from his parents. “It would be great if corporates or individuals could buy 100 books or more to donate to schools of their choice. We have a list of schools that can really benefit from the book,” Lerato says. While he loves being an author, the Grade 3 learner’s ambition is to be an animator. His book is filled with illustrations of the characters he writes about and he draws them all himself. Lelo is passionate about being an animator and collects as much information as he can about his favourite cartoons and superheroes. He can’t name one hero he favours above others as he “loves them all so much. It’s the longest list ever!” But if he were to stick to the top two it would be “Captain Underpants and Spider-Man”. He hopes to one day work for Dream-Works, the American animation studio that made the How to Train Your Dragon movies. “When DreamWorks is ready, I’ll be ready too,” he says.